I just made a big decision. I decided to discontinue what I was currently doing as a job and for the time being focus 100% of my working efforts onto MyrkoThum.com and my vision of my Lifestyle Business. I can’t go into too much detail yet but I have a plan and I’m in the process of executing it. More importantly with this decision I also follow my passion of personal development. Passion is just the ultimate fuel for your endeavors because it never really runs out. When you go after your passion, assuming you found your real passion, you tend to get more energy from working towards it. Most people who follow their passion wouldn’t really talk about it as work or as a job. Many would even do it for free, some would pay to do it. Others say following your passion and concentrating on what you love to do will probably result in failure. For instance in an article on CNN called Why ‘follow your passion’ is bad advice the author Cal Newport argues that trying to “follow your passion” in your career can lead to anxiety, job-hopping and disappointment. In another post called Dont Follow Your Passion, Follow Your Effort Marc Cuban says “Follow Your Passion” is easily the worst advice you could ever give or get. Instead he suggests to get good at that where you apply most of your time and effort – passion and success will follow. I think the core error that both of these articles saying “following your passion is bad advice” commit, is to assume that by following your passion you blindly want to make a money-making business from what you are enjoying in your spare time. Of course, it’s not that easy. It may work, or it may not. You have to educate yourself to know. So if you assume just by going into tunnel-vision, ignoring the market and your real abilities to excel, you will create success by following a passion you have… yes, you would most likely fail. The key is to do it intelligently and to use your passion as one of many other decision factors. The problem with the Marc Cuban approach of going where you currently spend your time and effort is simply that you may be numbing yourself by ignoring your passion and running after “success”. “Success” which most likely just means running after the money. Making money is great and there is absolutely nothing wrong about it, but making money the only focus in your life may blind you up to a point where you get so ignorant regarding your own needs that you justify a really unhappy career just because you get paid. Stephen Covey has a nice metaphor for this phenomenon: it is the ladder you climb leaning against the wrong wall. Don’t get me wrong, money should be a major focus in your life. You need to educate yourself about money and it’s good to have a drive to make as much money as you can. What I try to bring across is that anything that is taken to an extreme, ignoring other essential keys, is a problem. In my Success Guide I already said what I consider to be the 3 keys for a success: Passion, Skill and People. In other words you have to bring the skill and be really good at what you do, possibly the best, and there has to be a market where people are willing to spend money on what you’re offering without too much competition already. If you have both of these, being passionate is what enables you to become outstanding and eventually successful. 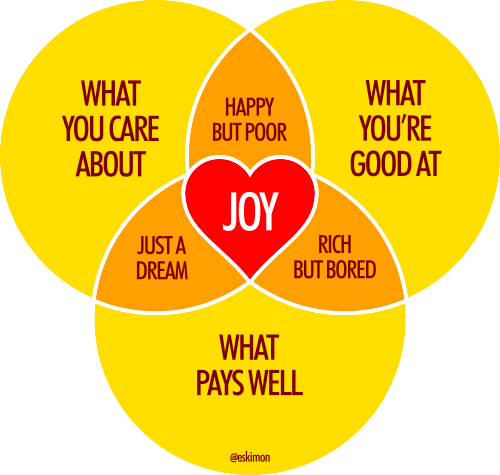 So being passionate is a core ingredient of a fulfilled and successful career. Follow your passion is not bad advice, but follow your passion blindly, ignoring the market opportunity and your skill-set, definitely is. Do I really love to do it and willing to spend the rest of my life on it? Am I good at this and willing to constantly improve to be at the top? Is there a group of people (a market) spending money for it? Also have a look at my post mentioned earlier called Success: The Only Guide You Need on How to Be Successful in Life which will give you an even better understanding how to match the 3 keys in your life. Thank you Beatriz! Having the courage to go for your dream is always admirable and you have my respect for that! What I personally think is one of the most important things when judging the potential success of following your passion is to have a correct understanding of the market opportunity. It is worth spending some quality time to research your market, your competition and size and willingness to buy (need) of people. It’s important and don’t ignore the market and jump blindly after your passion, which would be exactly what the two nay-sayer articles mentioned in my post talked about. I believe if you have something to offer that people would like to have, today is a great opportunity leveraging the internet to let people find you. The market doesn’t have to be huge. In fact I think it’s great if it is a niche market, competition is lower and since the internet enables you that a lot of people can come to you. But you have to be educated and do it the right way. If you find answers here, I’d say it’s a great opportunity right now. Maybe also take a look at the book “Crush It!” from Gary Vaynerchuk, inspiring guy too! Good luck to you and all who follow their passion intelligently! Good luck to you!! It takes great courage to move forward. I believe that following your passion is critical to happiness & fulfillment. In today’s world, “following your passion” is more complicated than it sounds. I am a faculty member & former administrator in higher education – in a small college in Portland Oregon – one of fifty such colleges in a nationwide for-profit system. The organizational ethics are highly questionable, the corporate competence laughable, the bureaucracy insane and we just went through traumatic system-wide downsizing (many of my colleagues lost their jobs). Students are paying very high tuition for declining student support resources, and are rolling up huge debt along the way. I have questioned my role in this system – perhaps my complicity. But, I love teaching. It is my heart. My livelihood. When I enter the classroom the whole world comes alive for me and I hope for the students. Even in the midst of such corporate greed, I find the peace and joy of my craft – I can come alive with hope and love. At 58 years old there are precious few options in the traditional job market for me. So I have been plotting a course outward with my own project to redefine higher education. I have the planning, a bit of validation from the community and the motivation. But the courage is still building. The time is approaching. So, best of luck in your efforts. I wish you well and will follow your progress as much as possible. William, this sounds like you are following your passion, despite difficult circumstances. Finding and giving hope and love is the good which is probably balancing out the bad for you and for your class. I always found the highest possible reward is being an inspiration for others, you seem to be that. So good luck to you too and thanks for your great comment on the topic!